Occasionally, I have second-hand speakers for sale. These will be completely factory refurbished. They will have newly rebuilt transducers that will be equal to, or better than, the originals. The cabinet and lens reinforcements will be upgraded to the latest state of the art. The amplifiers will be thoroughly gone through and will have all new, modern components. The electrostatic transducers are guaranteed against failure for a period of ten (10) years. The new replacement bass drivers carry a guarantee of one (1) year. Allow 90 days for delivery. If you own a pair of Beveridge speakers and wish to sell them, please contact me. I have found an extremely rare opportunity for the right music lover. This is far more than just a pair of speakers. This is a complete audio system which is up for sale. This system was meticulously put together by an extremely critical listener who derived tremendous pleasure from his music. Over the years I have met very, very few men as dedicated as he was. For pure fidelity, the system he put together is superior to any system, for any price, anywhere in the world today. 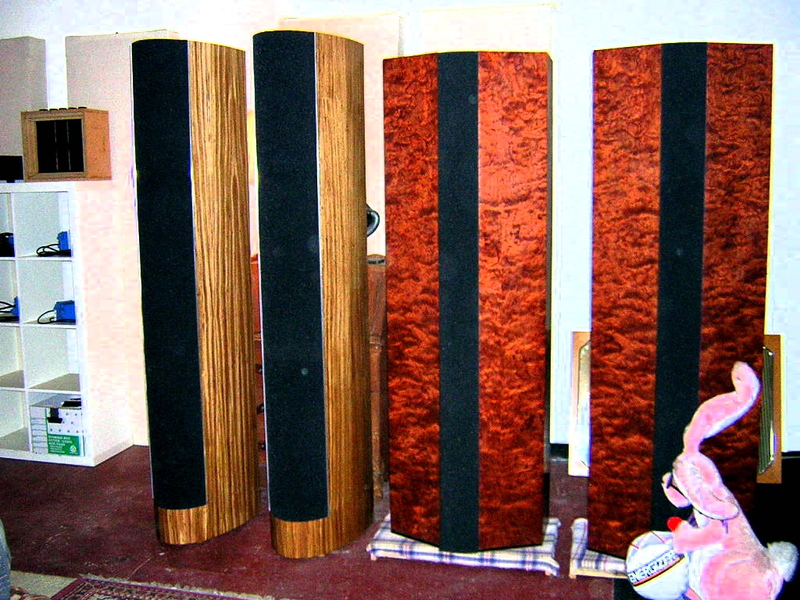 Of course, he had a pair of Beveridge model 2SW speakers. To drive these, he used a Bang & Olufsen turntable, a TEAC 234 OR reel-to-reel tape deck, a first class tuner, a McIntosh C20 Stereo Compensator, and much more. His collection of over 1,700 records was put together over 30 years. It even contains some virgin, unopened records! All of this is located in Richmond, Virginia. The pair of speakers on the left, above, are my version of the model 3. This design is called the G-3, in honor of Gladys Beveridge, my mother. The speakers are feminine (not big or broad shouldered), so they do not dominate the room like earlier Beveridge designs. This pair of G-3's is finished in Zebrawood. On the right is an almost new pair of model 2's. I made them myself, completely from scratch, about ten years ago. They are finished in Bubinga Burl. As you can see in this picture, they really do catch the light like an opal. When you move around the room, the reflections change. They are the most beautiful speakers I have ever seen. The sound quality from either pair is the only thing in this universe that will stop the Energizer Bunny right in his tracks.